Need a BIG handgun safe…that has all the bells and whistles? Vaultek ushers in a new large smart safe with the MX Series that lets you quickly access everything among 5 methods. AND hold up to 8 handguns. I’ve already reviewed the MX’s little bros…the VT10i and VT20i…which I loved and still use today. So Vaultek sent me their newest MXi. Let’s see if the big brother has what it takes…with videos of the safe in action! 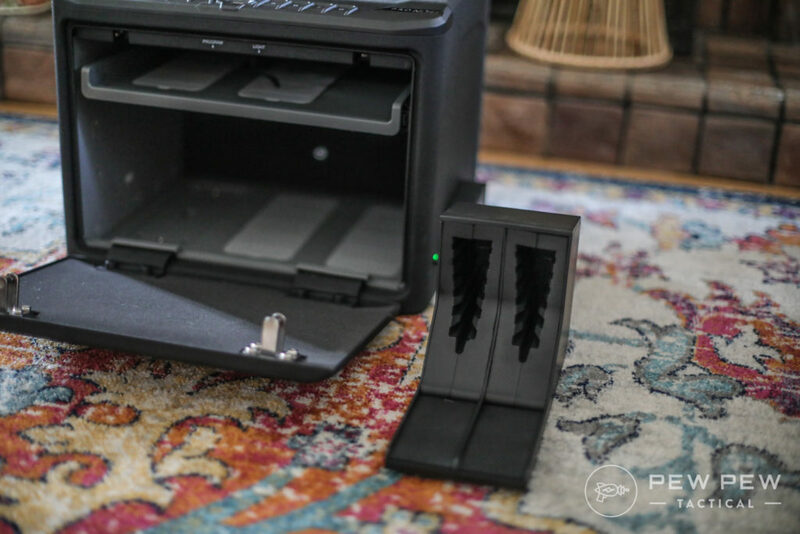 But if a high-tech safe isn’t what you’re looking for…check out our 15 Best Pistol & Long Gun Safes. 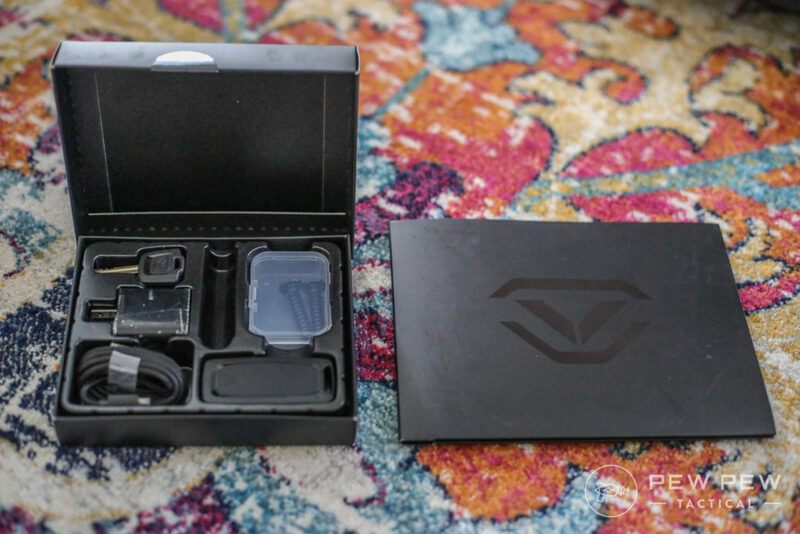 Like the smaller VT series…the MX came in wonderfully packaged. It was like opening up a new flagship cellphone. The safe even came with straps to help you lift it out without destroying the box. The MX is also pretty modular…and it comes with a dual handgun rack. The instructions came with a quick setup guide and also something more in-depth. First you set up a master password and then you can choose to enroll a bunch of fingerprints. Then you can enable the wireless Smart Key. By default the Smart Key will only work if the safe is active by lightly touching a button. You can also keep it in a continuous mode which uses more juice…but you can open the safe without getting near it (even in another room). Syncing the safe to the app was also easy. 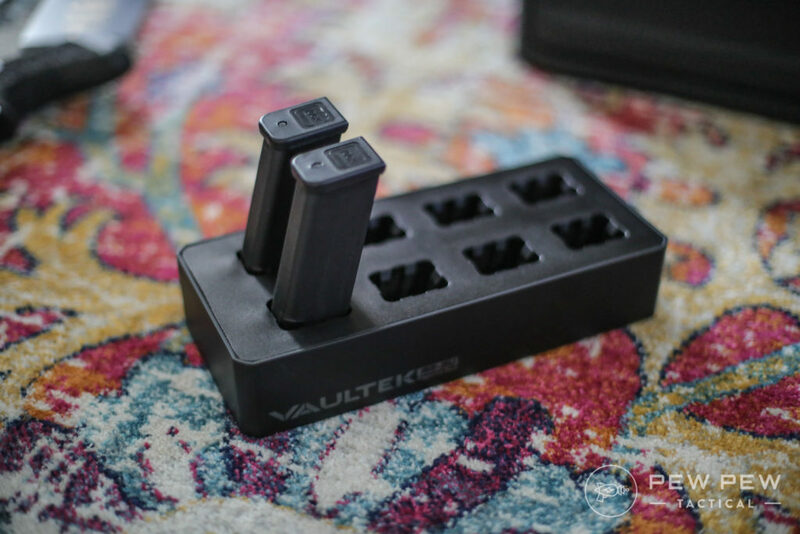 You can also add additional modular racks…like another dual pistol or a magazine rack for $35 each. 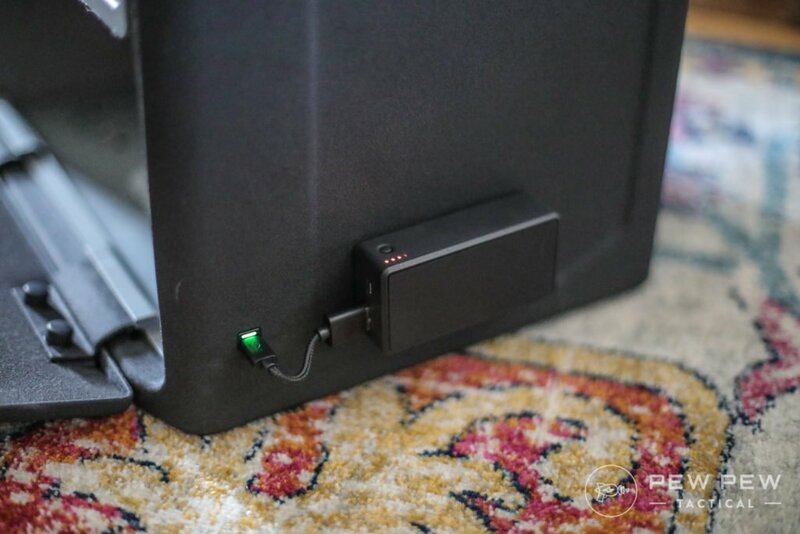 And also an external magnetically mounted Powerback that will give the decent 2.5 months charge up to another half year. You already saw the keypad and Smart key entry…here’s the fingerprint biometric reader. It’s not super fast at around 3 seconds from finger on to door open. And I’d sometimes get a string of misreads. But I found if I followed the instructions and moved my finger a little bit during the 5 capture setup…it did much better. Now…how does the app fare? Very easy to use via Bluetooth for opening and changing the light brightness…and you can also see the history of everything. 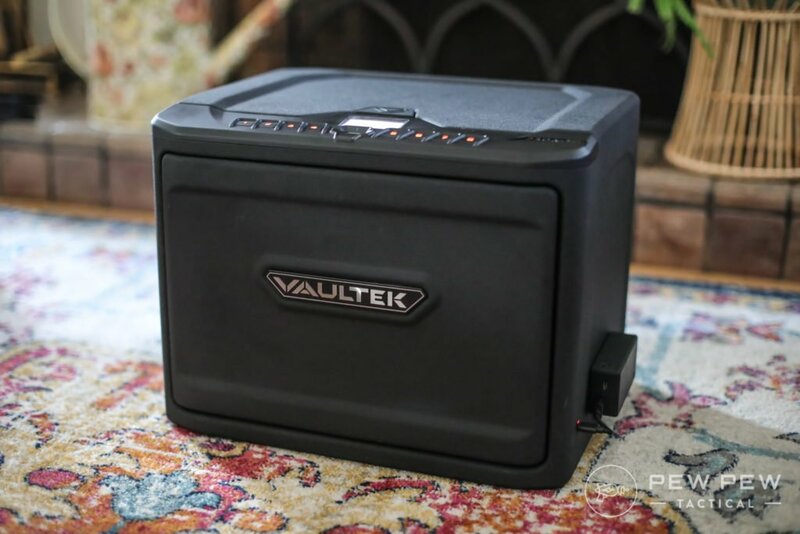 Plus…you can connect to all your other Vaultek safes. 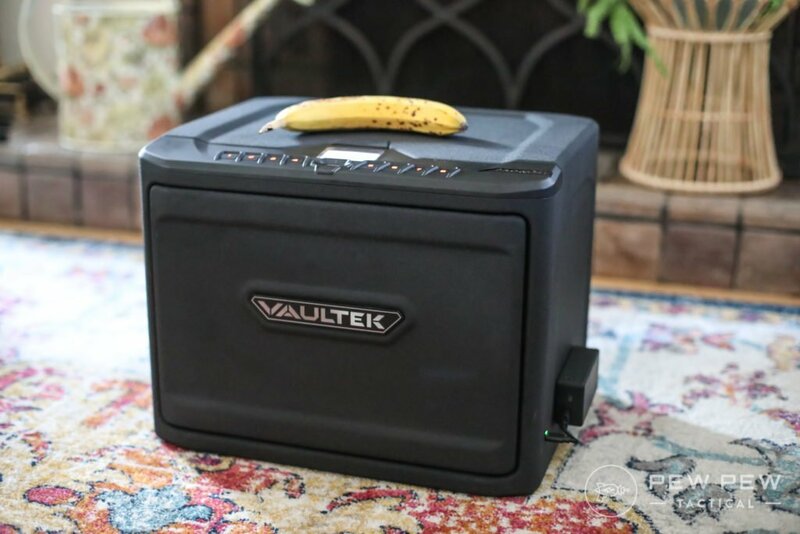 Vaultek definitely knows how to make a smart safe…how about the capacity of the MX series? I managed to fit in A LOT. 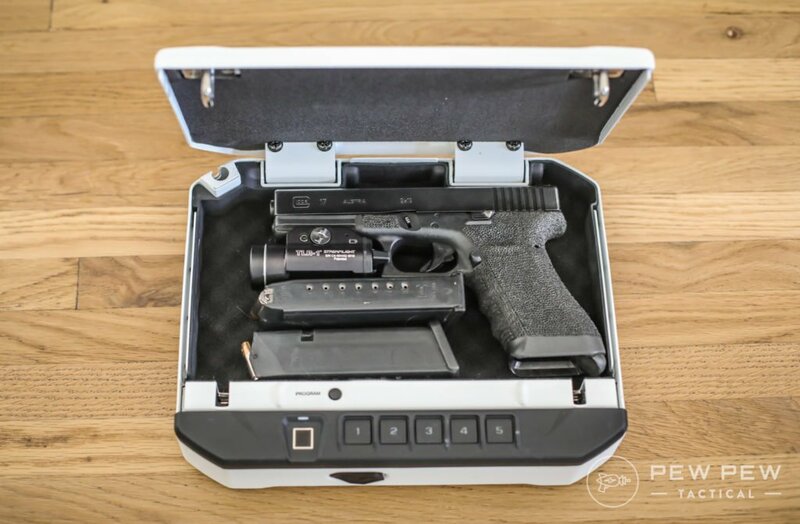 If you wanted to go pure handguns…you can swap out the magazine rack with another dual pistol…plus put at least two other handguns in the top drawer. The handgun racks are well designed…it can fit full-sized handguns with lights…and even ones with 6″ barrels like my HK Elite. Here’s how it is with a full magazine rack, 4 pistols, and some valuables. Channeling my inner poverty Jason Bourne. Even though it’s heavy…a reasonably strong person can still take it away even when fully loaded. I’d recommend bolting it down. There’s the smaller single/double handgun safes in the VT line from Vaultek. They also have multiple ways of entry. The “i” models have biometric readers while regular ones don’t…and are more affordable. Again…my full review of them here. 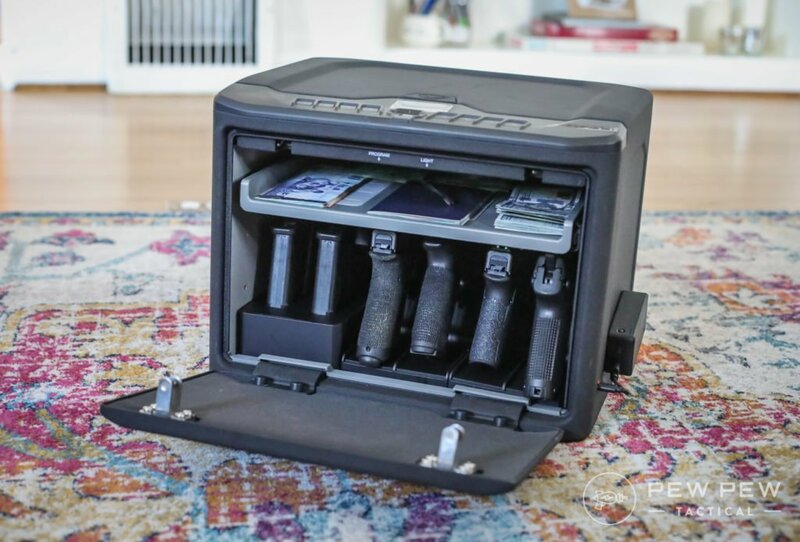 At the end of the day…if you need something big and robust for valuables and handguns (it has a 12-gauge steel front door and double-latch). But don’t want a full-on safe. 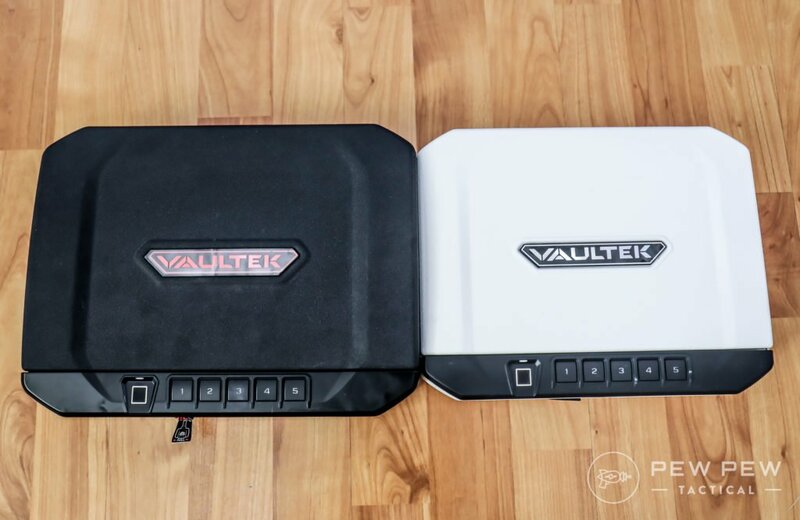 The Vaultek MXi might be for you. Just be sure it might not be the quickest access safe (at least biometric). If I were to use it as a nightstand gun safe (or a nightstand!) I would be sure to use the keypad function for something more foolproof. But with all the ways of entry…and endless options…this Vaultek is going to have a space in my closet for decently-quick access to valuables and multiple pistols. So…are you going Vaultek? Or are you looking for something more old school? 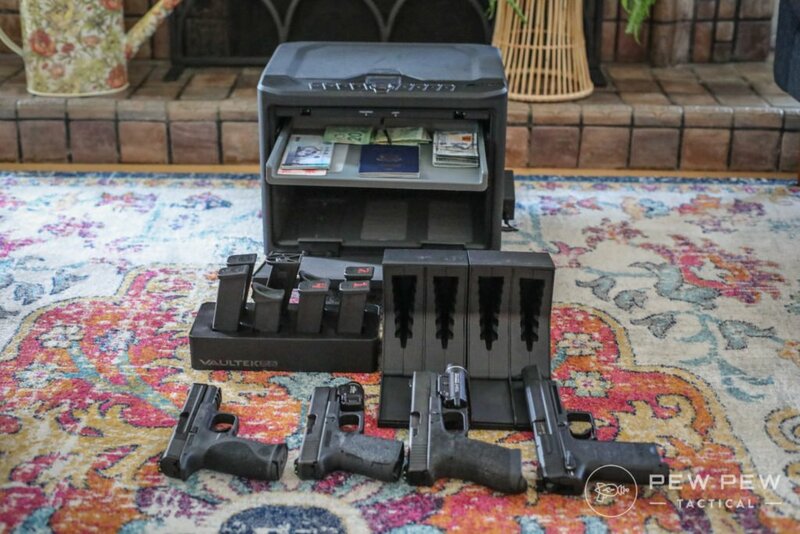 If so…check out our 15 Best Pistol & Long Gun Safes for All Budgets. I’d really expect more than 14 gauge walls for $450-$525. Similar to shotgun bore sizes, lower gauge numbers means thicker. 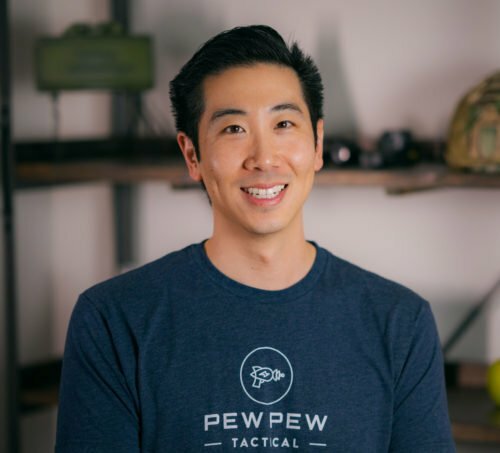 Also, once you start getting below 12 gauge, bending becomes much more difficult, making it less of a price-point issue than a design concept issue (welding and bolting start to become necessary). Well aware that lower is better. There are other safes in this price range that are 10 gauge walls and 7 gauge doors. Would like to see at least 10 gauge. I’m hoping facial recognition biometric technology will be implemented in gun safes in the near future. 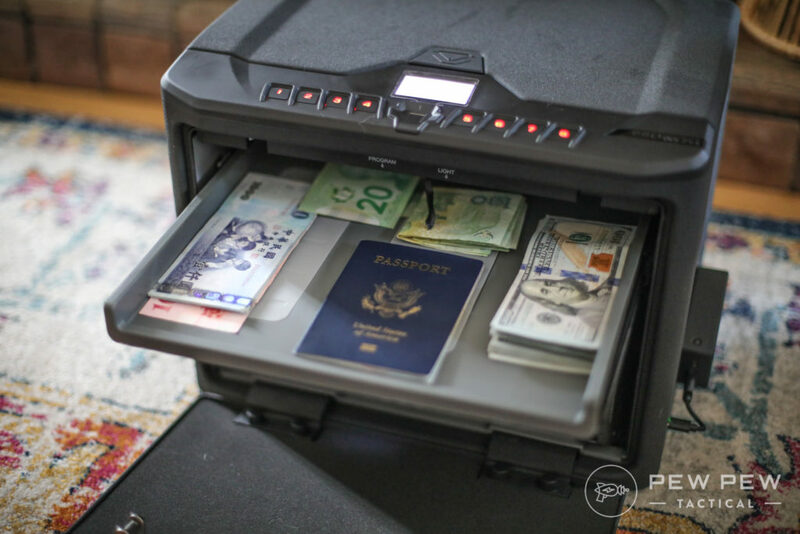 Maybe too costly at the moment for pistol safes but should not be a problem to price in an executive long-gun safe. My iPhone X facial recognition never ceases to amaze me, it’s very fast as in milliseconds and works in the dark. Of course, I would want a backup access method just in case HAL would not let me in…ha ha! Yup, it would help if you access a lot. But the paranoid in me thinks it could be much easier to forcibly enter the safe if you’re detained. Total buyer’s remorse getting the VTi Pro model, given the fingerprint reader just isn’t reliable enough…programmed 5 fingerprints in memory and usually have to go 2-3 (or more) to get it to open. Sure, sometimes it gets it on the first pass, but that’s definitely a rarity. I wouldn’t trust it if I heard someone downstairs in my house at 3am. No way. I’m buying another for the car, sans fingerprint reader. Other than that shortcoming, these are pretty solid safes. Yup, great safes once you realize the fingerprint reader is for convenience during normal use. I like and use my VTs but not as a bedside quick-access safe. I’ve had the same problem lucked out and won an auction on eBay and only paid 109$ for that model. The fingerprint reader hardly ever works. I’d suggest to all to get the cheaper model. I like the app it works great and it’s a sweet looking safe.